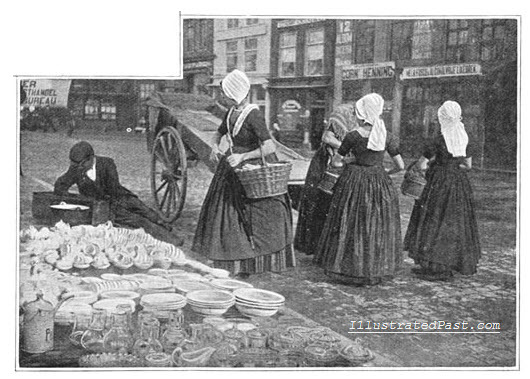 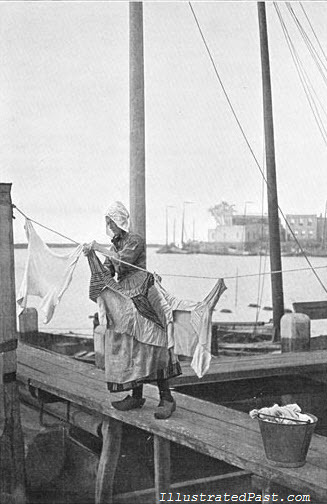 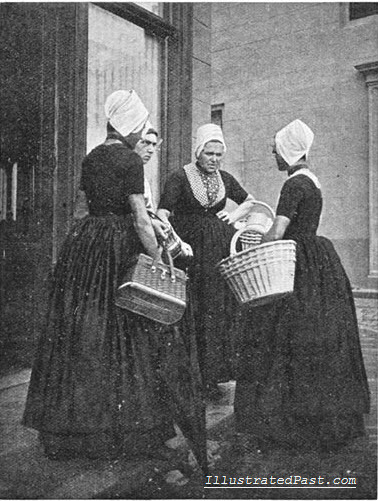 Not long ago clothing was based on local traditions and customs. 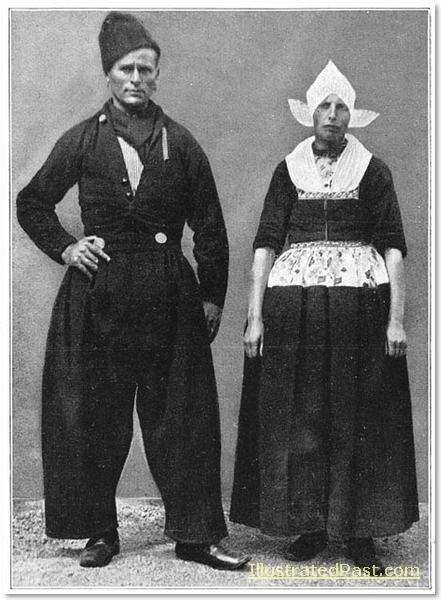 There were no national brands or fashions. 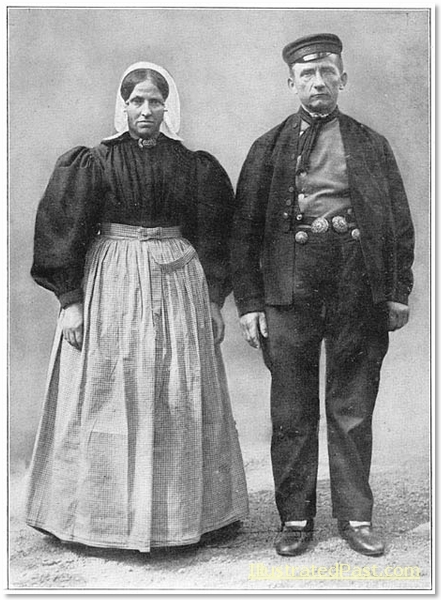 The clothing that one wore reflected the culture of the place: their village, their region. 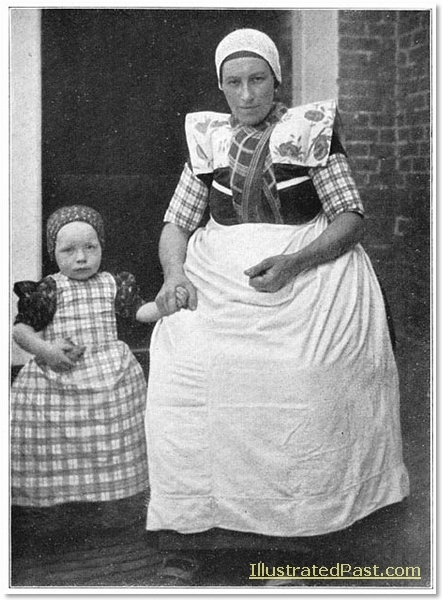 While there may have been less individuality within any given group, there was more diversity between nations and regions; each area had its own costume. 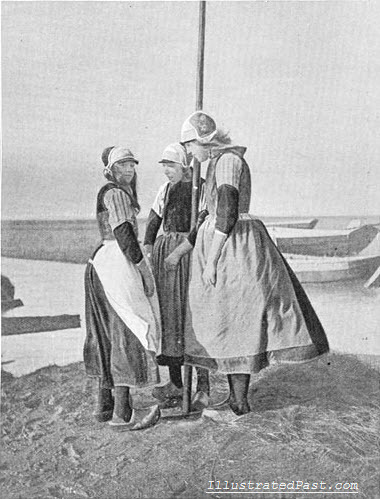 The individuals pictured are not dressed extras, but the actual and usual wearers of their costumes, so these images, therefore offer an authentic impression of the national dress. 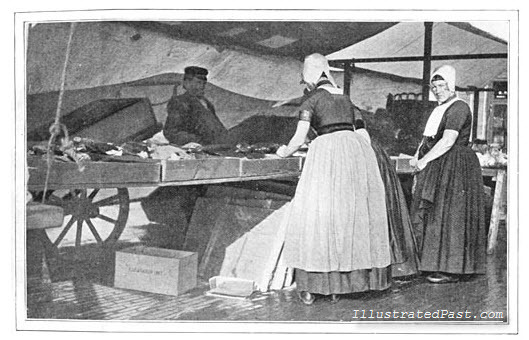 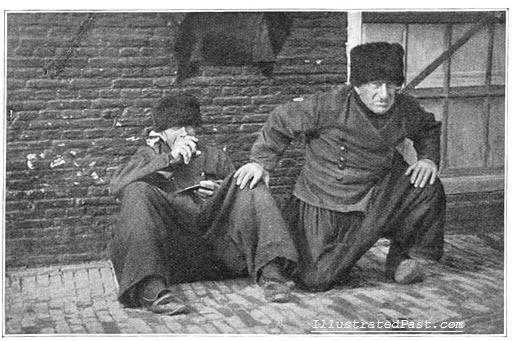 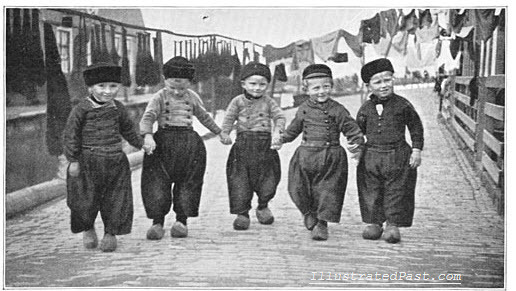 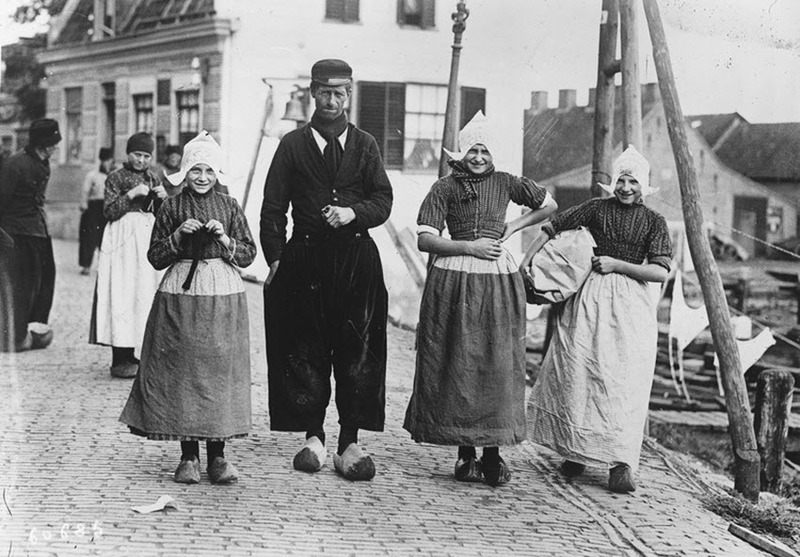 The first set of pictures document the national dress worn by the inhabitants of North Holland. 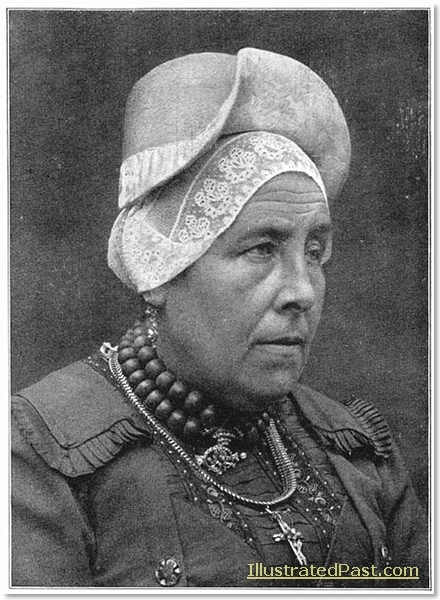 There were three main areas of cultural dress. 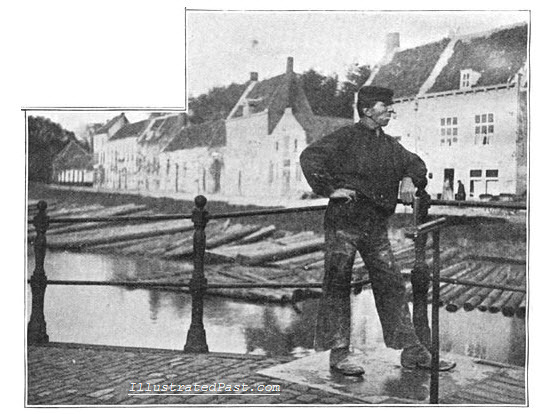 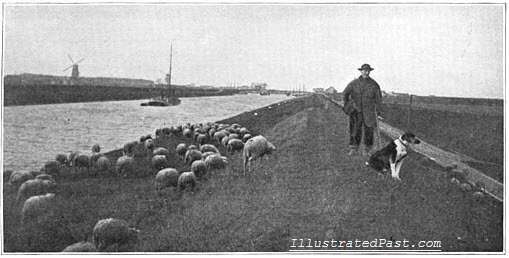 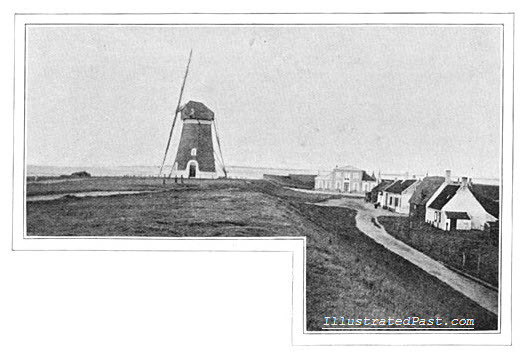 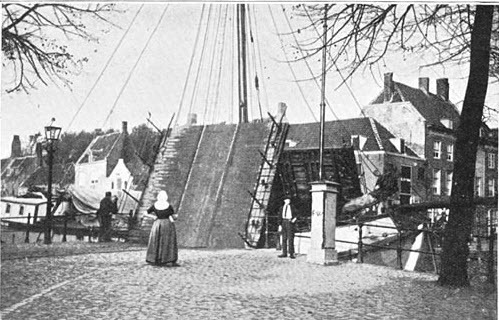 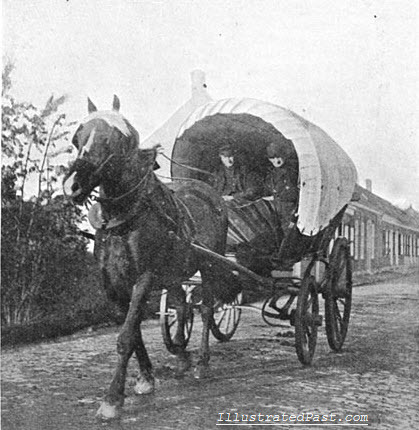 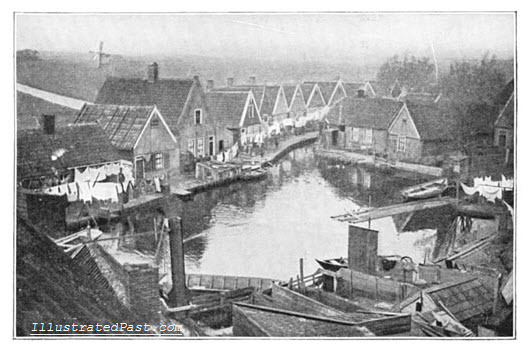 There were: Marken and Volendam, West Friesland, and the Gooi. 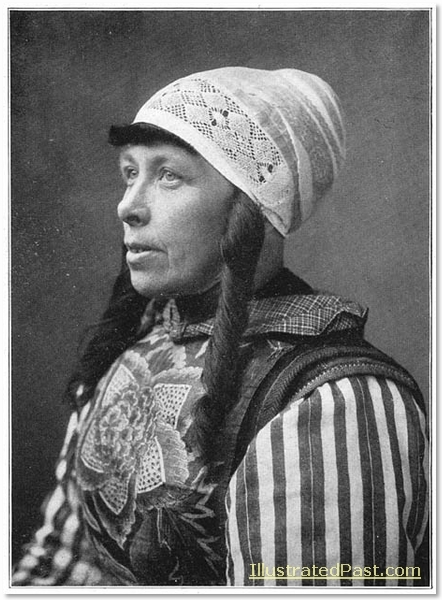 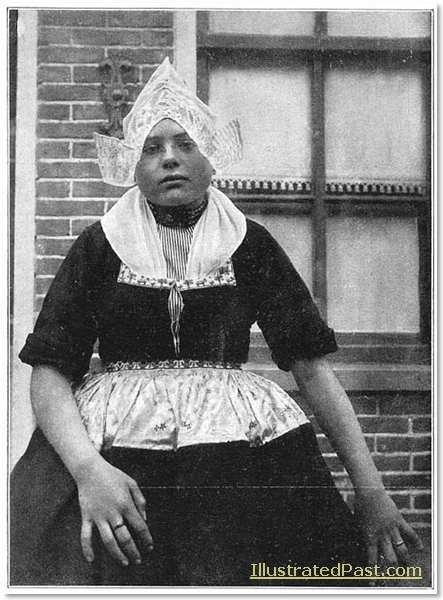 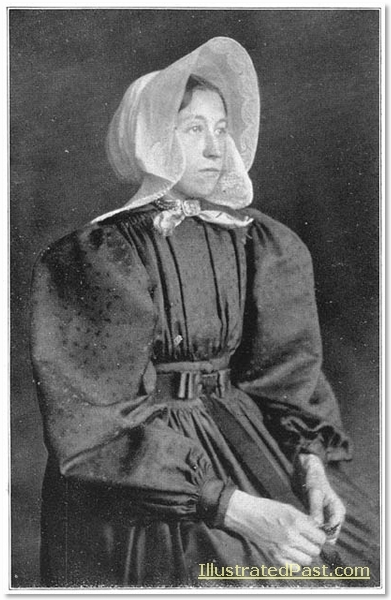 A woman from Marken Island, North Holland, wearing traditional costume. 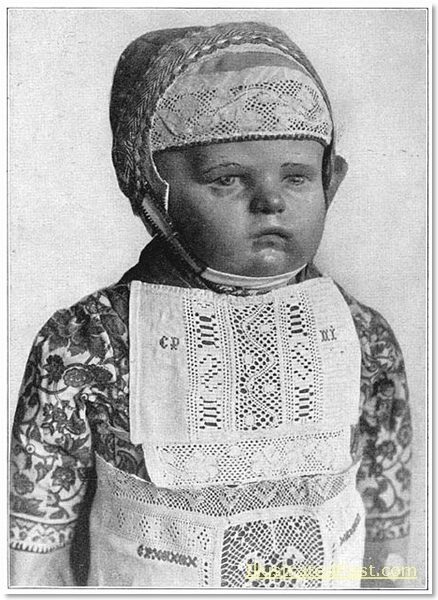 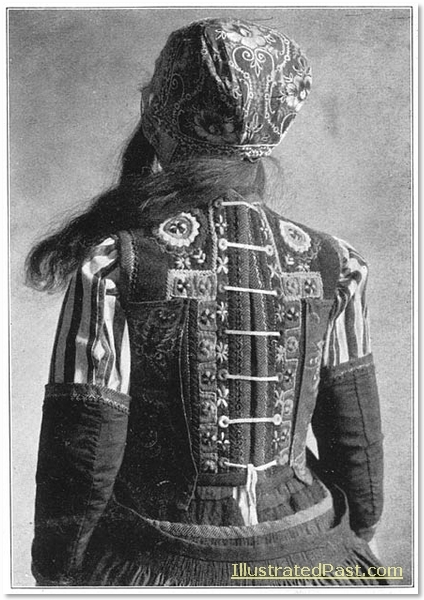 The elaborate breast plate is called “construction”. 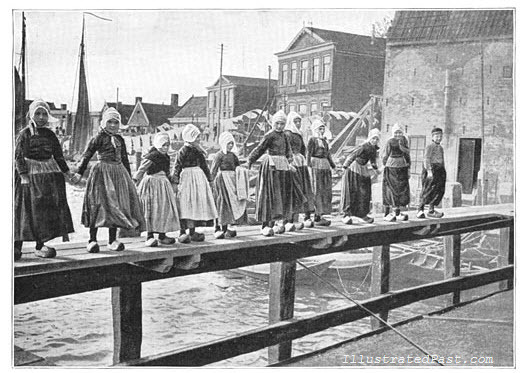 The picture above is of a wedding procession on Marken Island. 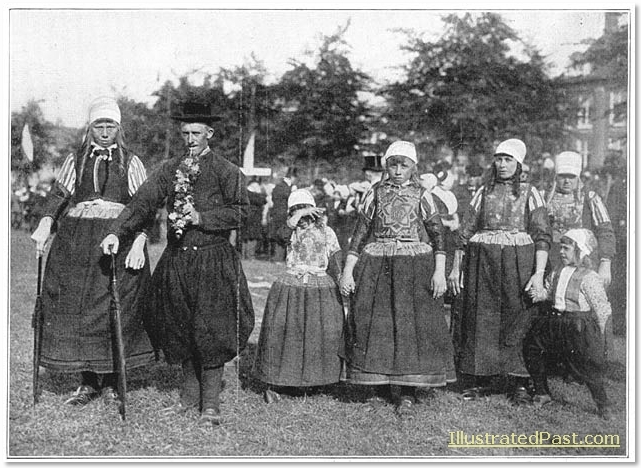 Everyone is wearing traditional dress. 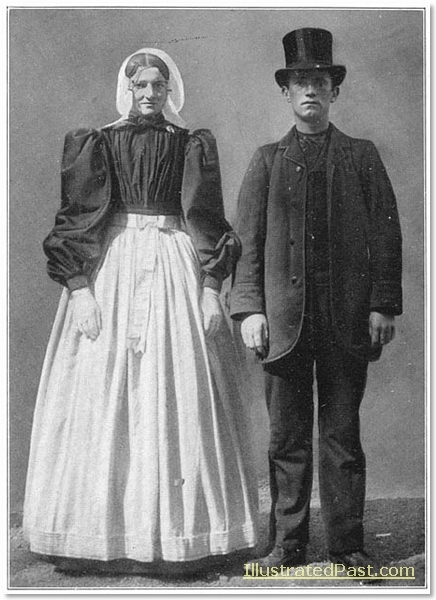 This in itself is a sharp contrast to the modern Western practice of the bride wearing a white wedding dress and the groom wearing a tuxedo. 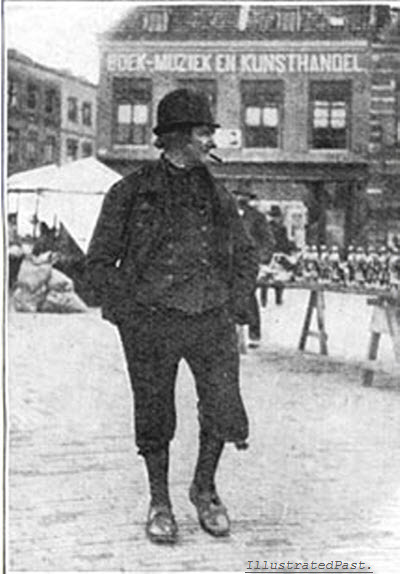 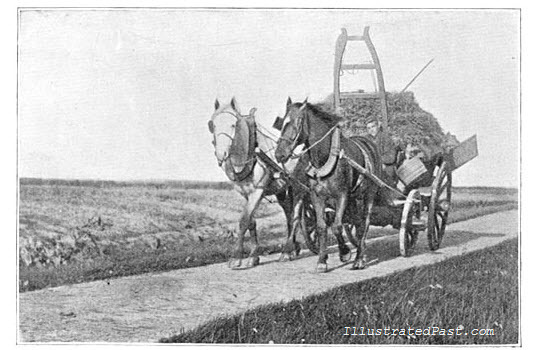 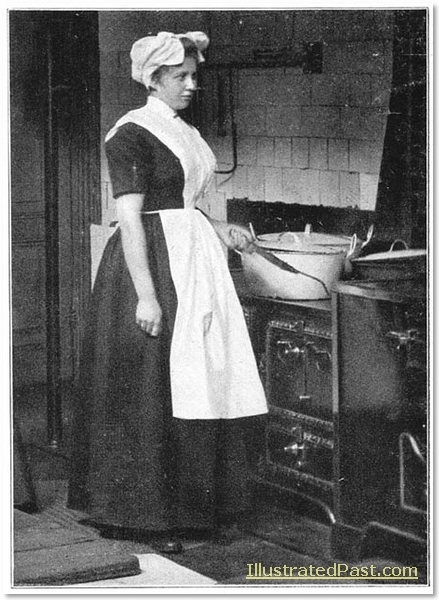 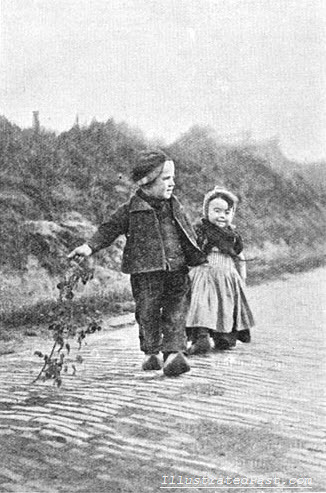 It is hard to imagine but just over a hundred years ago, what we consider tradition was anything but. 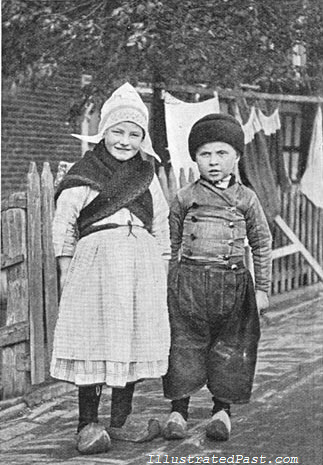 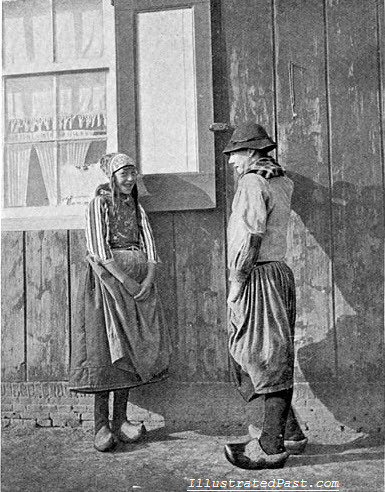 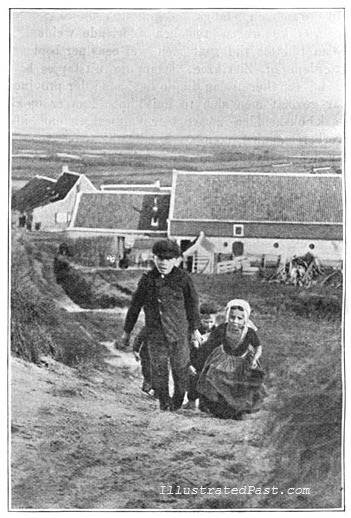 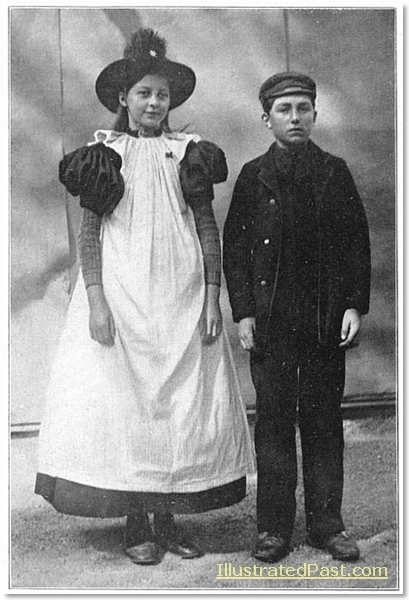 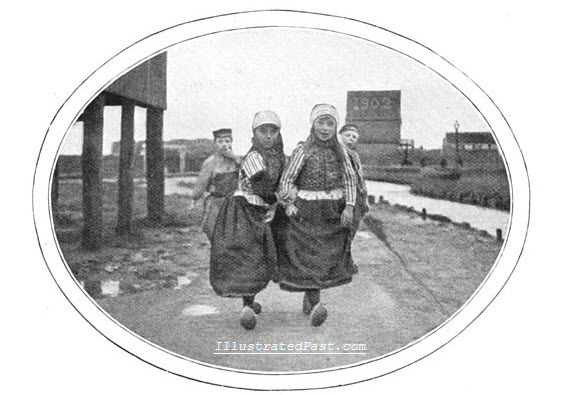 Boy and girl of Volendam. 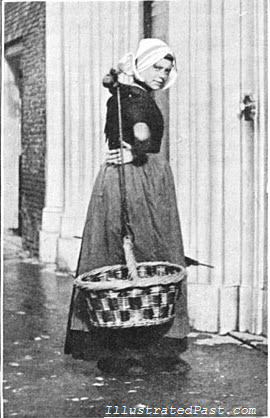 The picture above is of a young Duct woman from the Voldam area. 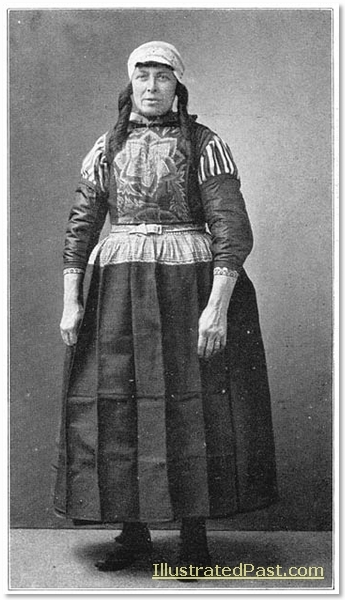 She is wearing her Sunday best. 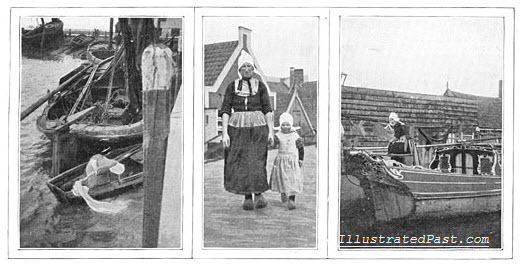 Older woman from West-Friesland in Holland Hull and boat hat. 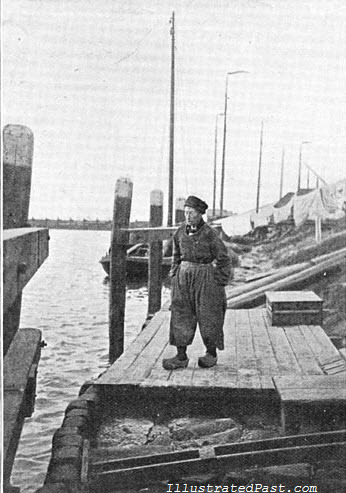 The so called “boat hat” was named after its hull-like shape. 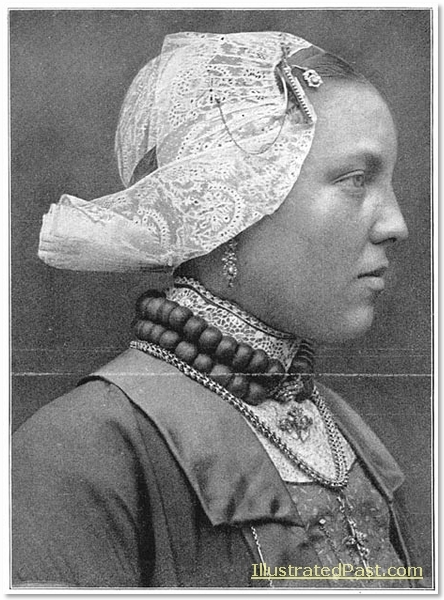 Made from very fine straw, this hat was typically worn by peasants. 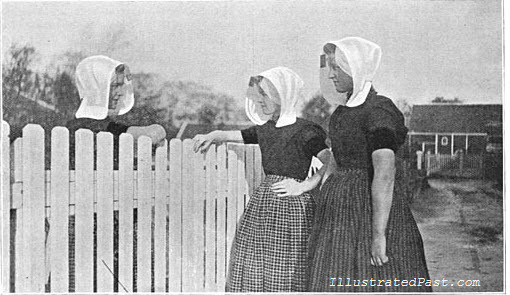 On Sundays the peasants would wear a hat with a white side edge, and if they were in mourning, they would put on a black border. 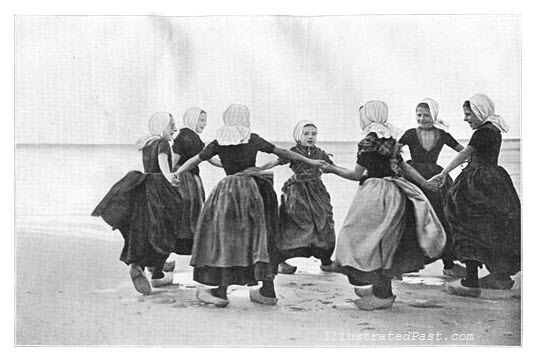 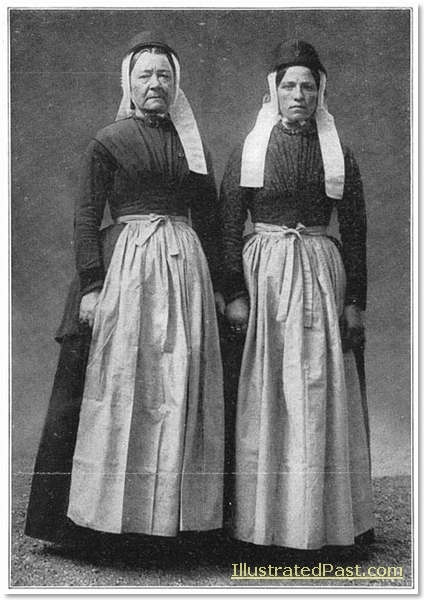 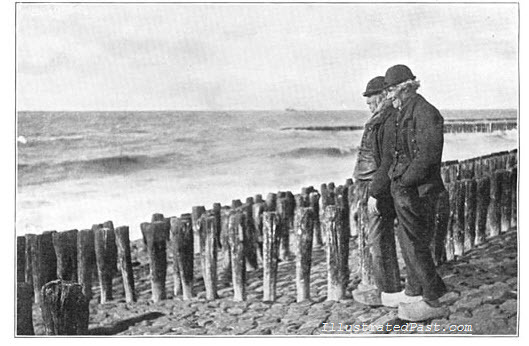 Two women from the island of Terschelling. 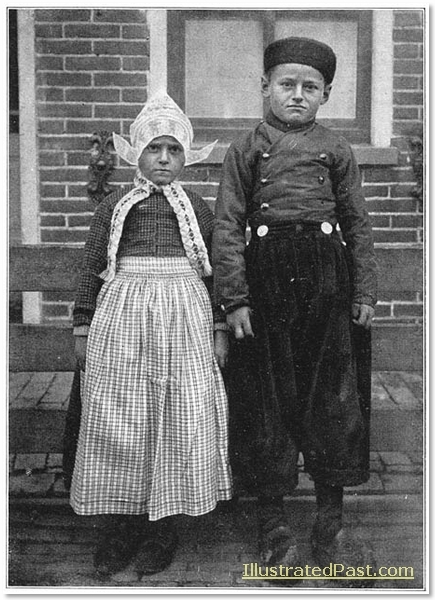 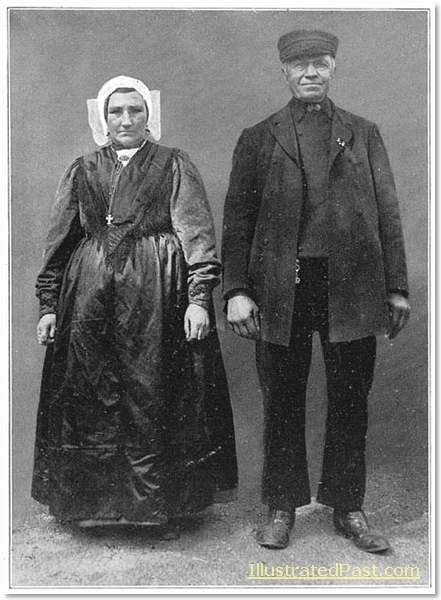 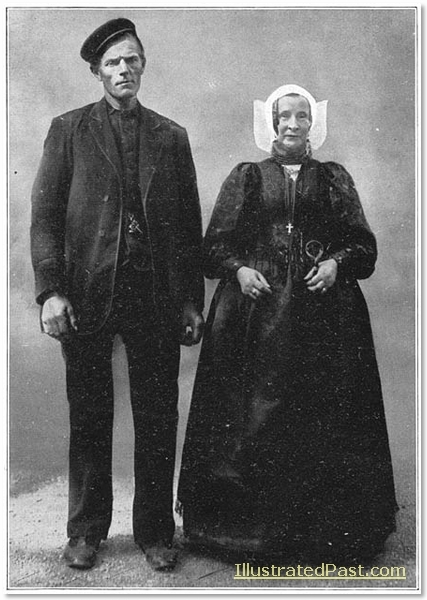 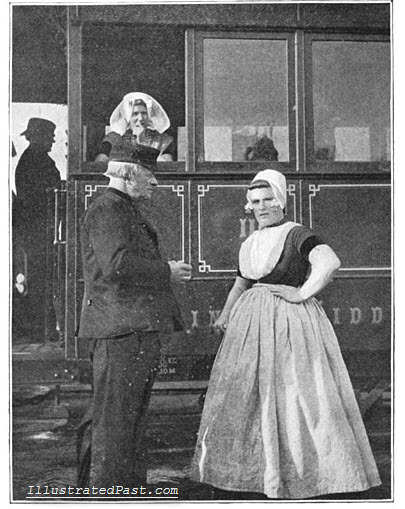 A young man and woman wearing traditional Dutch costume. 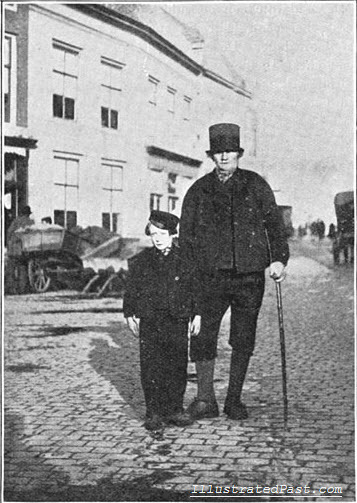 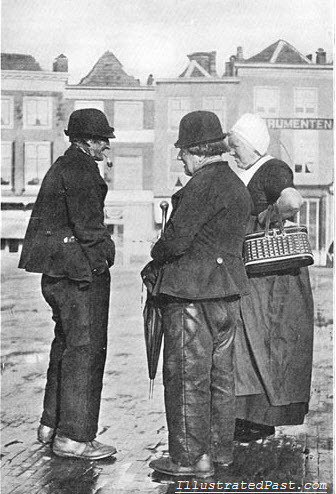 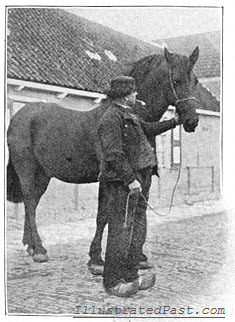 Man and woman in Laren, (in the Gooi). 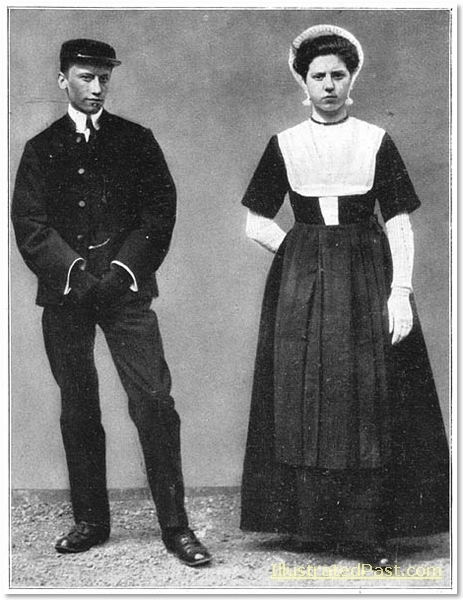 Ducth Bride and Groom in Traditional Dress. 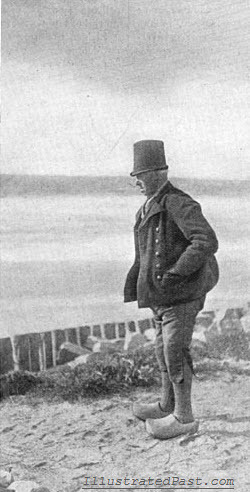 The top hat seems to be a foreign influence. 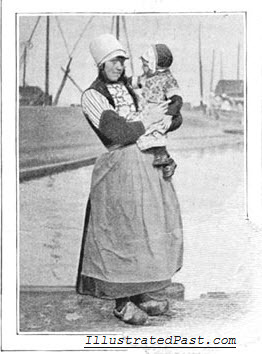 Young Ducth girl waring a hat. 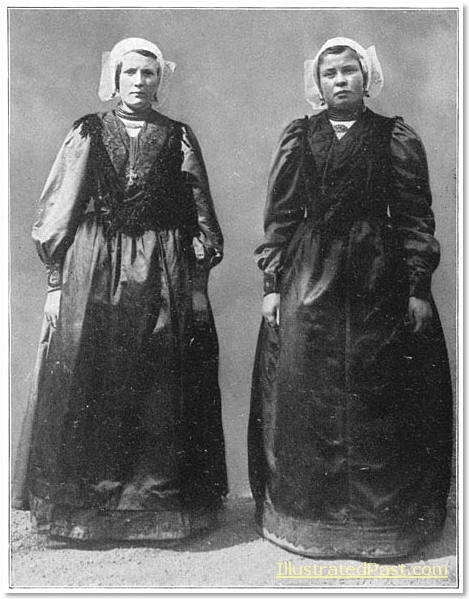 Two young women from Soest wearing square hats. 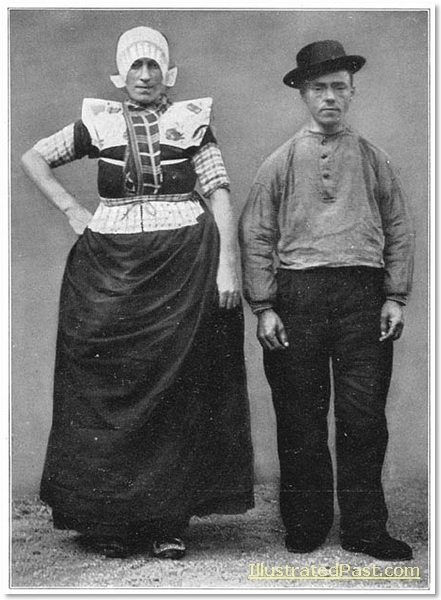 I hope that these pictures have provided you with a vivid look into the past and a way of life that has been lost to modern consumerism and the global economy: a culture were clothes were unique, prized objects, that confirmed the wearer’s identity and pride in their culture and roots. 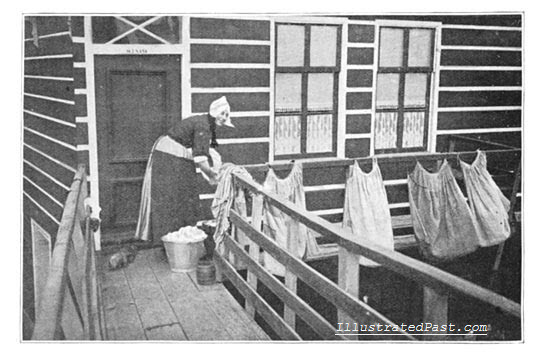 Think about that the next time you buy a mass produced t-shirt sewn in a sweat shop in some third world country.